Supply List: A2 polka dot assortment; Boys Only: cool camo, anyway, decked out; Mini brads: brass; Stamps: background and sentiment. Love all the projects today, the now and then layout is a great idea - i really like comparison photos, so fun to see how things have changed. Fun cards! I do love that layout and the progression it shows, and LOVE that adorable little card by Jing Jing too! Love the Celebrate card, very fun!! I spy the teensy type. 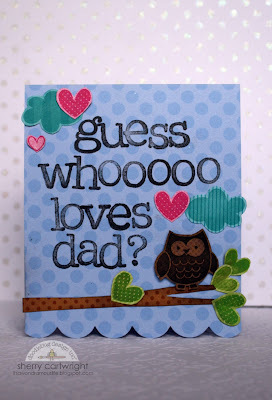 BBQ tools are the perfect embellishment for my dad, very cute card! All such great projects, ladies!!! Great projects. I love the cards! GREAT projects! LOVING all the details on that layout! This card is adorable! Love how you used the border stickers!